Learning to use an application software program by manually reading help tutorials can be real boring. If you are getting to know Microsoft Office 2010, then here is avery unique and interesting way to quickly learn on ‘how to use various tools in Microsoft Office 2010’ – through Office 2010 screensaver. This screensaver randomly show video tutorial tips and tricks for Microsoft Office 2010 programs. It is a free downloadable screensaver for Windows users which automatically downloads short video tips from Office.com website. 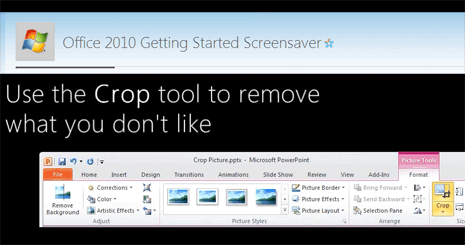 These How-to video tips are played on screensaver when computer is left idle for sometime. Alternatively, you can also manually launch the screensaver to watch video tips on your computer. This screensaver automatically download fresh video tips using RSS feed of Office.com video tips section. It also displays small pop-up box at bottom right part with featured tip, which you can click through to read more about it online. Hmm.. those videos were really helpful.Thanks for it.